The traction pattern on early Vans outsoles was all diamonds. The rubber would wear and crack too quickly under the ball of the foot. So they simply added one more set of lines to the original diamond pattern in that area. I've been told there's an Amish (or was it Shaker?) 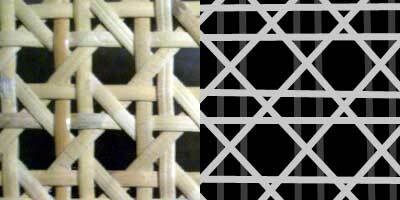 basket weave pattern that makes the same array of triangles and hexagons. But I don't think we need to assign it to any one tradition or object. It's just a pattern that can be woven. I couldn't find any basket examples online, but while watching a Japanese movie, I spotted some produce baskets demonstrating the quarter isogrid pattern. Frame grab and magnification above taken from "Dodes'ka Den", directed by Akira Kurosawa, released in 1970. You might consider the quarter isogrid pattern as a component of some caning patterns, though it's generally supplemented and obscured by other sets of lines. 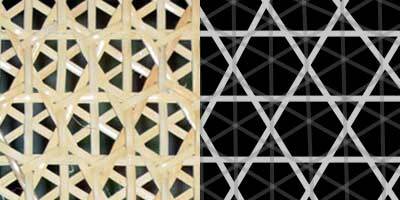 It seems to be an unavoidable result rather than an intentional building block of some of these complex weave patterns. Conventional caning can be seen as a quarter isogrid pattern, with non-uniform spacing between one of the three sets of lines, supplemented by a fourth set of parallel lines with the same non-uniform spacing. 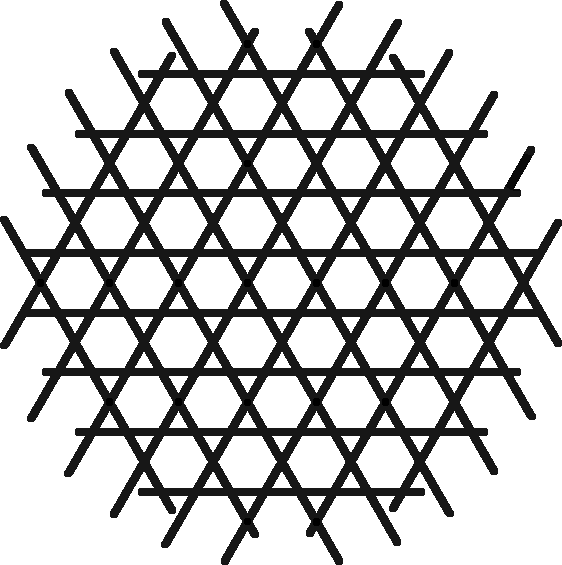 Diamond caning can be seen as a skewed quarter isogrid pattern, supplemented by a fourth set of parallel lines. 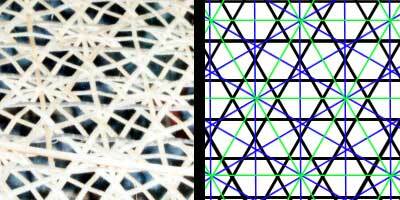 Spider web caning can be seen as the quarter isogrid pattern superimposed on the conventional isogrid pattern. 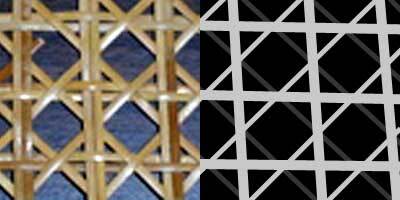 Star of David caning is a quarter isogrid, combined with two conventional isogrid patterns of different scale and orientation. It's a real tangle of lines that serve to fill in the triangles and one out of four of the quarter isogrid hexagons, to emphasize the stellated hexagon. In Ernst Haeckel's wonderful illustrations of sea life, both macroscopic and microscopic, Jan Seiler has found, and forwarded to me, at least one example where Haeckel explicitely sketches the quarter isogrid pattern, as one of many "crystal shapes" in calcareous sponges. This sketch appears in Visions of Nature: The Art And Science of Ernst Haeckel. I had hoped to find the pattern in Haeckel's illustrations of radiolaria, which I remembered first seeing as a poster in kindergarten. The collections of his illustrations I found online didn't seem to reveal the pattern, but I wouldn't be surprised if the pattern showed up again, deeper in the slightly less photogenic depths of that collection, or elsewhere in his work. Please send more historical uses of the quarter isogrid pattern. It's too obvious not to have been devised and used numerous times over the centuries, but I haven't found many examples yet, other than the ones above. I'm most interested in structural uses, but any use of the pattern is of interest.